M and I are on what I’m calling a retreat. We took off yesterday to a cabin rental in the foothills of the sierras. The back porch looks out over the edge of Yosemite national forest. The air is crisp and it is amazingly peaceful. We’ve had a busy few weeks (months really) and it was time to get away. We’re using it as a time to relax and clear our heads- just what we needed! 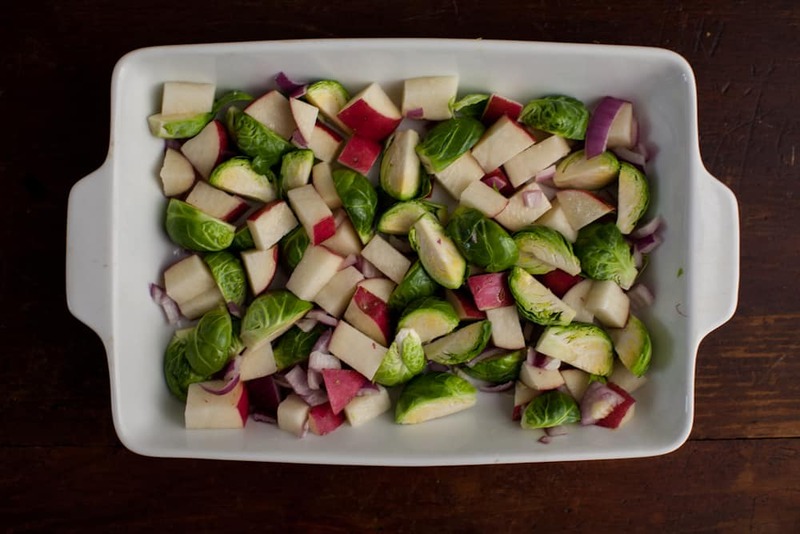 In a baking dish, toss red potato, brussels sprouts, onion, and olive oil together. Spread into a single layer. 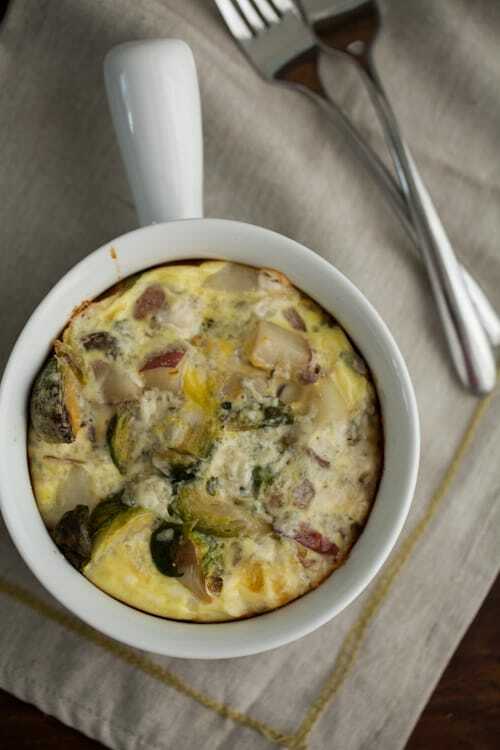 Bake for 25-30 minutes until potatoes are tender and Brussels sprouts are beginning to char. 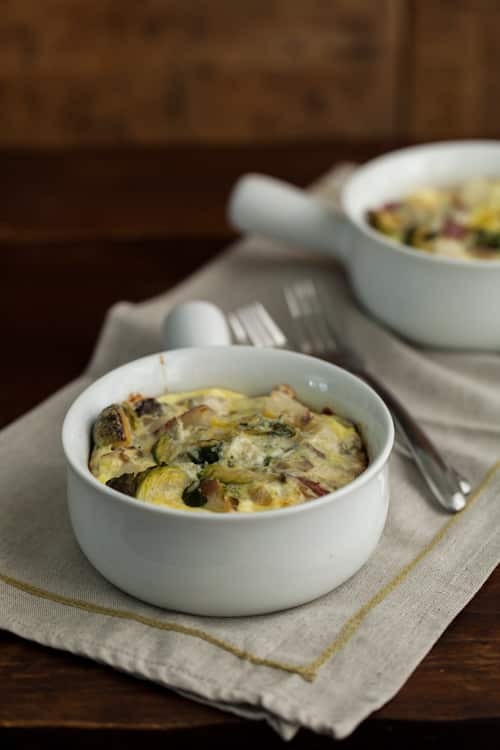 Remove and divide into two 5-6″ diameter baking dishes (think oven-proof soup bowls). Sprinkle an even amount into both baking dishes. Place both baking dishes onto a sheet tray. In a separate bowl, whisk together eggs, milk, sea salt, and black pepper. Pour even amounts into each baking dish. Place the egg bakes into the oven (still at 400˚) and baking for 30-35 minutes, checking after 20 minutes. Egg bakes are done with the eggs have domed and do not jiggle anymore. Remove from oven and serve immediately. This looks silly good! Can’t wait to try this one weekend morning! Does the cheese get mixed in or sprinkled on top? Your little retreat sounds so good! As do these bakes!! I love eggs and brussels! Have fun on your mini vacay!! You guys for sure deserve it!! And who doesn’t love eggs and potatoes? Perfect thing to wake up to. Soon we’ll be having Brussels sprouts in the garden, can’t wait to try this! Enjoy your time away!